This article describes how to enable the "Change language" selection for when using PhenixID auhtentication. The default language presented in authenticator web pages is taken from the web browser language settings. This can be changed by the end user by using the "Change Language" dropdown. 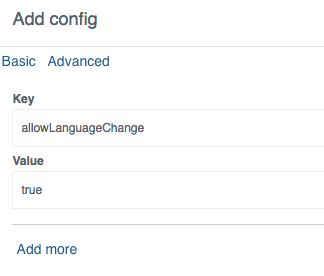 The "Change Language" dropdown is not enabled by default for authentication web pages. In the configuration manager go to Advanced tab. Expand "Authentication - HTTP". On the desired authenticator klick the plus sign right of configuration. in the screen enter as shown on the image. Stage and save the change.